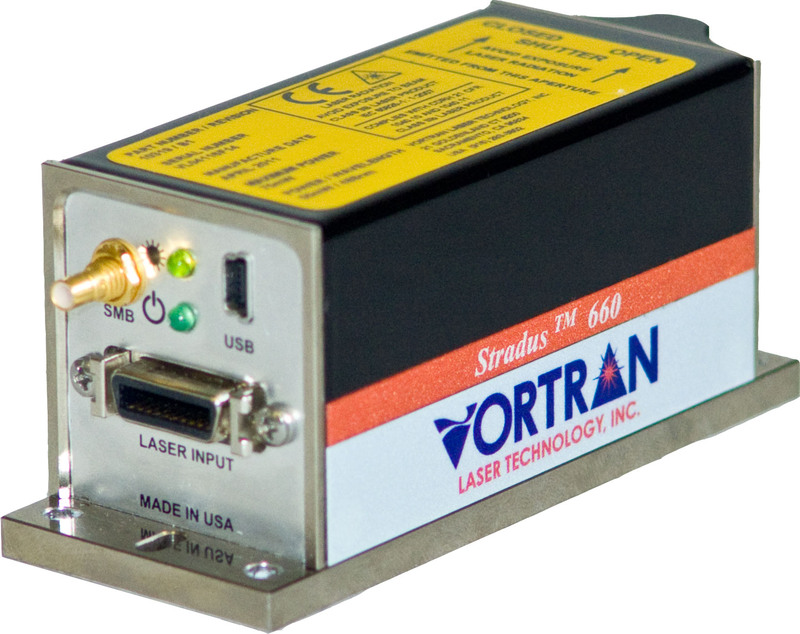 The Stradus® IR modules (705nm, 730nm and 785nm) are all direct diode, TEM00 lasers that offer the highest possible optical power and lowest noise available today. The IR lasers benefit greatly from the innovative sealed optics module that ensures long term power stability and longer life diode operation. The short term power stability is enhanced through the use of the external photo-detector – which is also protected from the outside environment by being inside the sealed optical module. The long term power stability is enhanced through the use of the sealed optics module – ensuring that any contaminants that are generated from the electronics do not affect the optics. Life test data (data available upon request) on Stradus® lasers confirm over 50,000 hours of operation. All Stradus® lasers can be operated manually by merely bringing the 12 volt DC power to the miniature D-connector on the Stradus®. The optional Remote Control Box, however, allows for the CDRH Safety features (keyed lock switch for on/off), interlock connections, as well as external emissions indicator LED. A user can hook a PC up to the RS-232 connector on the Remote Control Box, or hook up a PC directly to the Stradus® via a USB cable to the mini-USB connector on the Stradus®. The user, through the use of any PC, can interface to the Stradus® through the user interface software that is supplied with each standard Stradus® laser. The user interface allows for easy and efficient control of all laser functions as well as an effective monitoring display of key laser parameters (e.g., laser power, diode current, and both diode and base plate temperatures).